I can't say I have ever seen a truer idea and I truly believe that being punched in the face really served a purpose for me. Sure, I fought as a kid in playground scraps, but, once, I was driving to school on a rainy morning and -- I don't remember why -- I had to hit the brakes, hard, almost slamming into the car in front of me. Apparently that angered a guy behind me, who followed me in to the school parking lot and punched me in right in the jaw as I got out of my car. He connected pretty well. It really didn't hurt. More importantly, it did no damage either to my heart or my body. I wish I could tell you about how I knocked him out, but he was back in his car and gone before I knew (literally) what his me. Take the metaphor where you will, but it happened to me a few other times in my life and, for me, it serves as a reminder that even the most violent things are not necessarily as bad as they seem. After all, what sounds worse than "getting punched in the face"? 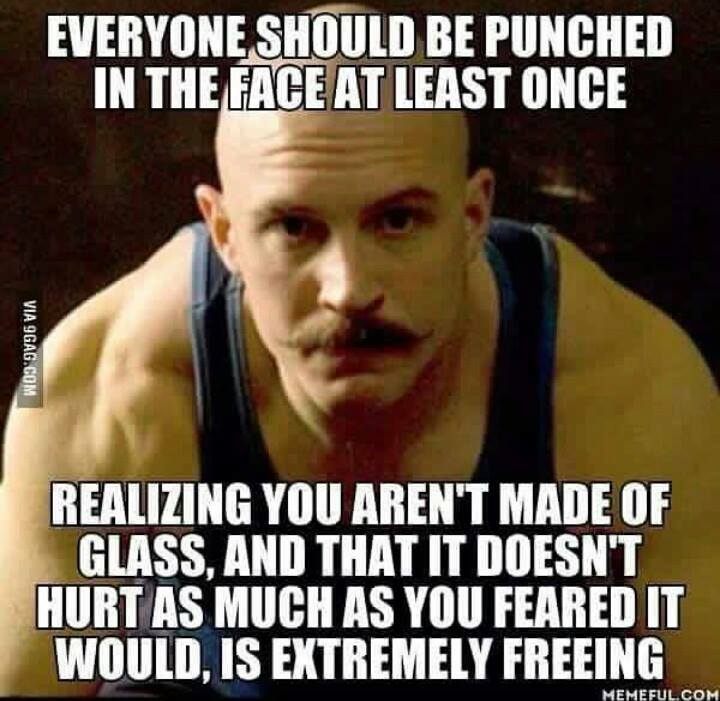 I have often thought about that punch when facing challenges and this meme reminded me of that.